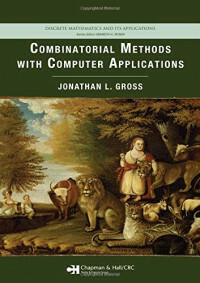 Combinatorial Methods with Computer Applications provides in-depth coverage of recurrences, generating functions, partitions, and permutations, along with some of the most interesting graph and network topics, design constructions, and finite geometries. Requiring only a foundation in discrete mathematics, it can serve as the textbook in a combinatorial methods course or in a combined graph theory and combinatorics course. After an introduction to combinatorics, the book explores six systematic approaches within a comprehensive framework: sequences, solving recurrences, evaluating summation expressions, binomial coefficients, partitions and permutations, and integer methods. The author then focuses on graph theory, covering topics such as trees, isomorphism, automorphism, planarity, coloring, and network flows. The final chapters discuss automorphism groups in algebraic counting methods and describe combinatorial designs, including Latin squares, block designs, projective planes, and affine planes. In addition, the appendix supplies background material on relations, functions, algebraic systems, finite fields, and vector spaces. Paving the way for students to understand and perform combinatorial calculations, this accessible text presents the discrete methods necessary for applications to algorithmic analysis, performance evaluation, and statistics as well as for the solution of combinatorial problems in engineering and the social sciences.